When Ben invites his best friend, Jesse, for a weeklong getaway to his family’s beachside vacation home, Jesse is thrilled! It’ll be the perfect way to spend some quality bro time together, away from jobs, chores, and Ben’s nagging mother, who is always asking him when he’s going to find a nice girl and settle down. He’ll settle down later - when he finds the perfect girl. Tom McCallister has been in love with his best friend Lyla for as long as he can remember, but what would be the point of telling her that? He's known that it's hopeless ever since she came out to him as a lesbian during their freshman year of college. Lyla likes women, and Tom is definitely not a woman. But when Tom loses both his job and his girlfriend on the same day, Lyla is still the first person he turns to for support. She tells him to drop everything and fly out to see her in New York, confident that some friend time is exactly what he needs to get through his slump. A frat house needs new members to pay the rent. Can a femboy become the hero by being the first girl member? Would you be a hero and become fully feminized in order to save the Frat? Frank did with the help of his friend Stacey, who takes Frank under her wing to turn him into Fran. Fran has experiences he never would have had before he was feminized. Fully crossdressed and feminized, Fran finds an addiction to deal with and becomes the focus of attention for her fellow frat members. Dress like a girl to join an elite society? A master’s degree student wants to join an exclusive and elite secret society where the members network and become huge successes financially. The only problem is that he has to pay his dues first. Can he do it? Membership requirements: A good person, unbiased, non-judgmental, with no homophobic or gender-slandering tendencies. An understanding of the importance of balancing masculine and feminine energies. Dedicated to helping other members. Able to keep secrets. If you, a person close to you, a spouse or partner, or a friend of yours is involved in male-to-female crossdressing, has an interest in it, or is bored and wants to try something new and exciting then drop the veil of illusions by creating a new feminine illusion and thrive. Listen and hear what benefits can follow in this thoughtful guide that just might improve your or someone else’s life - or at least help you understand it better. A femboy becomes a girl? A witch offers a potion to a friend to turn him into a woman for a week. If his true inner self ends up relating to the new female body, he’ll stay that way for the rest of his life; if not, he’ll turn back into a male. Will he adapt to a new life with men being interested in him, or will his old paradigms cause him to return to the male form at the end of the week? Will he lose the witch-girlfriend he has always been in love with and end up with a man, or will they come closer together? On a cold night in an abandoned construction site, a dying alien grants five brave children the power to morph into any animal or person they can touch so that they can fight back against a secret invasion of evil, mind-controlling slugs called the "Yucks." Arnold knows this because he was there, hiding behind a half-built wall, and saw everything. He even accidentally got the same powers the children did! When Rick, a high-powered, rich financier, unexpectedly arrives at the gates of heaven and is denied entry because of the self-centered way he lived his life, all he wants is a second chance to make up for past mistakes. He’d always intended to be more generous and kinder to people - he was just planning to do it in his golden years. When the angels give him the chance to go back to Earth in a young, fit body and prove the truth of his intentions, Rick eagerly accepts. Getting to be young all over again while keeping all of his accumulated wisdom sounds like a great deal. This book gives you solid, easy-to-follow instructions, ideas, and useful suggestions on how to quickly and easily achieve a feminine look. 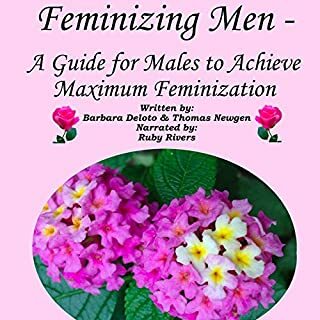 It goes over various important feminization tips regarding body hair, choosing your female name, how to properly disguise your private parts, how to enhance your figure for a more curvy look, how to apply makeup, and the importance of feminine hands and feet, etc. When starship captain Benjamin Rollins beams down to a strange alien planet that appears to have signs of intelligent life, he is shocked to be greeted by a human-like race of beings that traveled from Earth millennia ago and which claim to share a common ancestor with him. Their planet Titan is a wondrous utopia - their people live in peace and harmony, strife is unknown, and coupling is free and frequent. Sam was just another lazy kid - no direction in life, hanging out at his parents’ house, no girlfriend, listless. His parents gave him choices: move out and work the only kind of job he was ready for, a minimum-wage job, or join the service, or go to a girls’ finishing school. After his initial shock, Sam saw finishing school as the easiest way out, giving him another year to goof off and be surrounded by gorgeous, rich girls, and have a free ride for another year. Sam becomes Samantha and goes off to school - a school where the girls are taught how to take care of a man and be the ideal wife. He’s trained in all aspects of taking care of a man and is torn between his male desires and ego, and the desires his new role creates in his feminized, cross-dressed, gender-bending self. Enter the world of a cross-dressed and feminized male and see if there is any chance for the new "gurl" in this short new adult LGBT hot and steamy transgender romance. This is one of the hottest books I've read on Audible, and I've read 340+ books, all of 5hwm at least twice. i love my stories, i read qith a critical eye and a genuine appreciation for the creative whimys of freaks like myself. A great story and fantasy, something many men secretly wish could happen to them. The book is well written and read. all I have to say is great story, and we'll written and a very good turn on. This was an interesting story that was enjoyable to listen to. On the whole I thought it was really good, although a few things did bother me with it a little bit. On the story side I had a hard time getting past the many plot holes and far-fetched events that result in the protagonist’s transformation. On the performance side, Ruby Rivers is an outstanding narrator when doing female voices, but her male voices are a bit too exaggerated and “cheesy” for me, although I think some of that can be chalked up to the story dialogue. yes! I loved this book it was so fun to hear it. this wus my vary first audio book and I really got into it. I'm varry happy that I got this story. I'm definitely going to listen to it again thank you! I wish I was Sam I cant stop thinking about how awsome it would be to be in his/her shoes. The storyline is quite good however the writing could be better. The voices were very bad. The could of been better by have different people do different voices instead of one person.